While buying your favorite brand online, do you keep a constant eye on the SSL lock in the URL? Do you always have the thought in your mind that perhaps the card, whose information you are entering online, may be misused and your money may be siphoned off? Well, ecommerce suffers from the biggest bottlenecks like these – skepticism coming from the customers themselves, forget about the technology and infrastructure needed to make it commonly used. Now Flipkart, which last year sold $500 million worth of merchandise and pledged to double this by 2015, is doing something to change this perception. 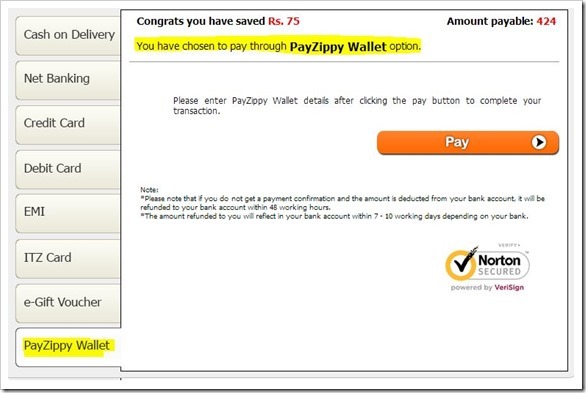 Few months ago, Flipkart launched it’s own new payment gateway called PayZippy. It was being rigorously tested on Flipkart.com – and it has now opened up for consumer purchases. With PayZippy, online buyers have to just save their card details (like card number, expiry date, name, etc.) only once and use it securely on any website without typing or sharing this sensitive information on the website the user is using it to shop. PayZippy’s payment systems have passed stringent security audits like PCI DSS (Payment Card Industry Data Security Standards) conducted by industry experts, to ensure that your card information remains safe and protected at all times. Online shoppers in India will get respite from repeatedly filling in card information across various merchant sites. Once stored, users would not have to repeatedly input card information across websites, thus saving the trouble of repeatedly entering the multiple numbers and cross-checking it. This customer-facing product promises to let users enjoy a faster, smoother and safer online payment experience across a range of merchants like BabyOye, BlueStone, JustEat, LensKart, MakeMyTrip, Travelyaari, Trendin, YepMe and Zansaar as of now. They also have launched offers like cash backs, discounts on transactions and gift vouchers on the merchant sites for the early birds, so that users get accustomed to the new way of paying online, win freebies and pass on the good news around. Yes: PayZippy says that they do not store the card’s CVV number or 3D secure password. The card details are always encrypted. With password stealing becoming common even from ‘secure’ sites, this should put our doubts to rest. Why investing in payment gateways or digital wallets: With millions in funding, Flipkart is looking for a breakeven in the near-future. And that can only happen when the channels of bleeding stop. The solution is seen as an attempt to wean online customers away from cash-on-delivery, a payment method used for 65 per cent of all online transactions, which actually bleeds the retailer. E-payments is an ambitious idea in a market where there is only 20% credit card penetration, according to a 2012 HSBC report, with a lot of problems still existing for those who do want to use them online. Just couple of days ago we gave you the news that Snapdeal is coming up with its own payment gateway and now this! Looks like Indian ecommerce space is surely heating up.